Item Number: H20-2656PK Have a question about this item? 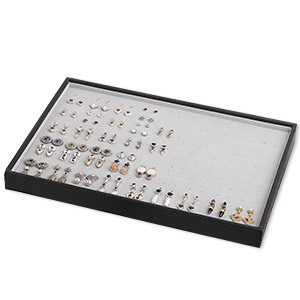 Black leatherette display trays have a grey velveteen insert that holds up to 99 pairs of earrings and can double as a beading board. Trays conveniently stack for storage and travel. Colors, shapes and sizes may vary in each lot.